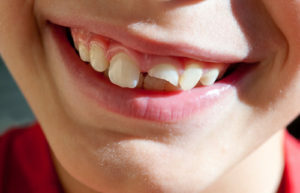 Home » Blog » Cosmetic Dentistry » What To Do With a Chipped Tooth! What To Do With a Chipped Tooth! One of the most common but unexpected dental emergencies happens when an individual experiences a chipped, or even completely broken tooth. Teeth chips or breaks can be acquired in a number of ways, but frequent occurrences can be the result of a nasty fall, being struck in the face, biting hard or incorrectly, or they can even be the result of crumbling fillings, or untreated tooth decay. The experience can be accompanied by bleeding gums or sharp pains, both of which can increase instances of shock and trauma. But experiencing a chipped or broken tooth doesn’t have to be a cause for alarm. Both chipped and broken teeth can be well treated, and swiftly fixed in order to get you back to great shape in no time. Here are a few things to keep in mind. If you find that you have a cracked or chipped tooth, don’t wait to take action. Be proactive by rinsing your mouth out with lukewarm water to remove any food or debris from the area. If you have salt present, use a saltwater solution for your rinse, as it will discourage infection. If a significant portion of your tooth has chipped off, take care not to rinse it down the drain, and wrap it in a small plastic bag with a few drops of water or a moistened cotton ball for safekeeping. If you find that your gums are bleeding, use a clean piece of gauze to put gentle pressure on the area. This should gradually reduce the blood flow. If any area of your mouth has become swollen from a hard impact, an ice pack to the area is recommended. In the immediate aftermath of a chipped tooth you will also want to take care not to cut your inner gums or tongue on what may now be a very sharp or jagged tooth surface. In extreme situations, you can use dental wax or sugarless gum to form a soft barrier between the broken tooth and your mouth soft tissue. Any residual pain can be alleviated with an over the counter pain reliever. Avoid foods and beverages of either temperature extreme until your tooth has been treated. The next thing you will want to do as soon as possible is to visit your dentist. It is important to schedule the visit swiftly in order to prevent any potential gum infections or permanent nerve damage to the chipped or broken tooth. Be sure to convey to the dentist how the tooth was broken. After a dental evaluation, the dentist may recommend any number of procedures ranging from edge polishing (for very minor breaks), filling, bonding, crown coverings, and even tooth replacement (in the case of severe breaks). Keep in mind that many instances of broken teeth can be avoided. Upkeep in dental hygiene practices is an excellent first line of defense, and if you are active, be sure to use appropriate mouth protectors in order to avoid problems. Even if you do accidentally chip or break a tooth, we’ve got you covered. Give our dental office a ring and we’ll get you taken care of in no time! ← Afraid to Get a root Canal? This Information Will Help!